Like some flexibility in the kitchen and love breakfast? Ya us to, that why we created this unique breakfast bundle by Hamilton Beach. This bundle includes a Programmable 12 Cup coffee maker by Melitta, the name trusted in Coffee with the Breakfast Burrito Maker. Save the time (and the money) by driving through a favorite coffee shop or food chain. Brew a favorite fresh brown bean at home through a machine that brews hotter through a cone to maximize that flavor. Then top if off a favorite healthy burrito with fresh ingredients that you control form the local grocer. BUT don’t settle at just a burrito. Feel free to make 12/9 to 12/15 Stuffed pancakes, omelettes, crepes, even a personal pizza. This bundle should not disappoint. Coffee enthusiasts take note. 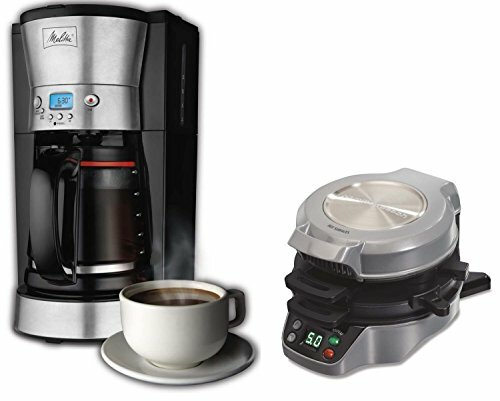 Melitta 12-Cup Coffee Maker, Programmable (46893) Next time you say, “Let’s go get coffee,” think twice about rushing out to the coffeehouse, local shop or drive-thru to purchase some coffee and guzzling it down. Creating the perfect cup is something special to be savored. Something delightfully indulgent and memorable, something that evokes every sentiment of an authentic European café. That’s the promise of Melitta. Intelligent design, detailed craftsmanship, full-bodied flavor and a sensuous experience in every sip. Toss a wrench in the breakfast routine forever. Just layer your favorite ingredients and the work is done. Place a tortilla in the maker, add eggs, cheese, peppers, ham and much more and you have a delicious burrito.It has a built-in timer with an audible tone to let you know when cooking is complete. This feature lets you get ready while you wait for your breakfast to finish. Usage is not limited to making burritos as you can make stuffed pancakes, crepes, personal pizzas and much more. The cooking surfaces are non-stick for easy lifting of food. All of the removable parts are top rack dishwasher safe for simple cleaning. This Hamilton Beach burrito maker comes with a recipe booklet to help you.